We're not USDA certified organic, but we do follow the USDA organic rules religiously, with one exception detailed immediately below. We're also Certified Naturally Grown--read more below. The word "organic" is very heavily legislated in the United States--in fact, since 1990 it's been illegal to identify yourself as an organic farm if you haven't jumped through the bureaucratic hoops (and paperwork and expense) of USDA certification. If we sold wholesale, where our veggies were ending up nameless on some grocery store shelf, that rubber stamp would be important. Since we're able to have this conversation with you, our members, customers, community, and friends, we feel it's an unnecessary diversion of resources from what we'd rather do: Care for our land, grow great veggies, and be great farmers. The only deviation we make from the USDA organic rules is a biodegradeable mulch called biotelo. This mulch is made in Italy from non-GMO cornstalks, and is certified organic by IFOAM and EcoCert, the European and Canadian organic bodies (generally considered to be much stricter than USDA). After years of petitioning, USDA is finally going to permit biodegradable mulches... some time in 2014 or 15. Click HERE to read a very detailed article about this stuff if you want. Made from non-GMO corn residue, Biotelo costs three times as much as plastic mulch, but breaks down like crop residue instead of clogging our landfills with trash. We use this mulch because it absorbs sunlight and helps warm the soil up, which is important for those warm season crops like tomatoes, sweet peppers, and eggplants. It's like wearing a black shirt on a hot day, but for the ground. It also helps with weed control, which is a constant battle in a system without herbicides. USDA organic is fine with the mulching system, but they demand growers use a plastic mulch--imagine a 4000' foot long hefty bag--and then pick up all that plastic and haul it to a landfill each fall. Even on a small farm like ours, that's a couple pick-up trucks of plastic getting stuffed into the dump every single season. It's actually about 1/3 the cost of the biodegradable stuff, but we find the environmental impact simply unconscionable and refuse to play ball. Other than that, we follow all their rules--organic seeds, natural fertilizers, no synthetic pesticides or herbicides, etc. Not because they say so, but because we feel it's right. If you have any questions at all, we welcome them. We're proud of how we care for this farm, and we want you to be, too. The teeth of the USDA organic program is a laundry list of things you can or can not do. To me, it's like defining a good mother as someone who doesn't beat her child, choke her child, starve her child, etc. Like parenthood, caring for a piece of land is about more than NOT doing terrible things. It's about nurturing and caring and thoughtful support. It's about helping this little thing become the fullest, healthiest, happiest it can be. THAT'S being a good farmer. We want our farm to be stronger and healthier with each passing season--in fact, we feel it's our obligation as landowners. We also believe a healthy, living, diverse farm can grow more delicious and nutritious food than one that's just being limped along, and we're willing to put our money where our mouth is: half of our farm goes into full season cover crops each year. This choice means half of our acreage isn't available to grow an income-producing crop, but the tangible effects on the soil health and the quality and flavor of the vegetables is astounding. 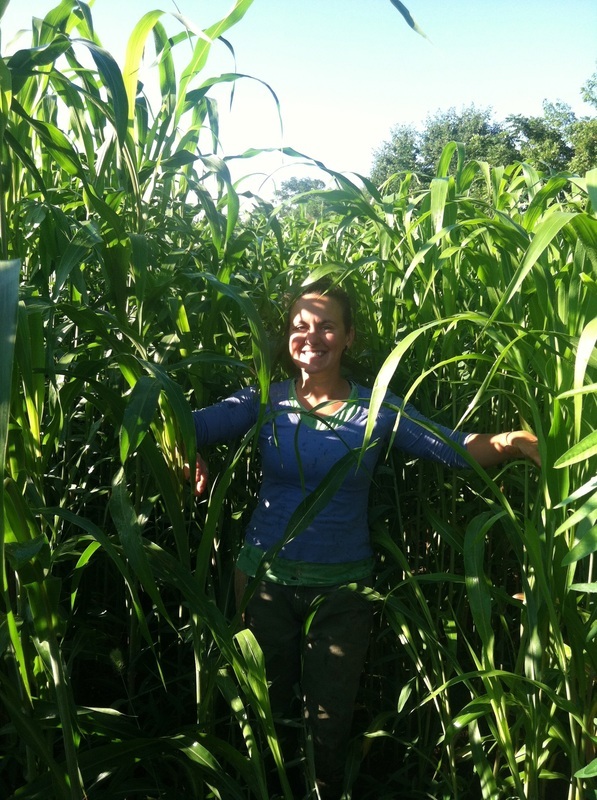 Cara standing in a cover-crop of Sudan grass, a full-season cover that contributes tremendously to the soil structure and health. Other covers provide natural fertility by capturing nitrogen from the air, or combat weeds, or prevent erosion, or any myriad other helps. In addition to cover crops, we go to great lengths to maintain crop rotations that thwart pests and disease. We also manage our fields with permanently grassed "lanes" for equipment--these lanes also take away from our cash-crop producing acreage, but the sod handles the traffic of equipment and irrigation hardware without compacting the soil, which means the actual beds have a healthier environment for the soil microflora and fauna and, of course, for the veggies. Those lanes are also seeded with clovers, which along with generous headlands and riparian zones, provide habitat for the beneficial insects who are our teammates. We also closely monitor the micronutrient balance of our soils, to make sure our plants have all the minerals and "vitamins" they need. You can get a big yield with incomplete nutrition and plant health the same way you can get an obesity epidemic with Big Macs--but neither indicates health or vitality. We're interested in more than big, we want GOOD--for the world, the farm, the plants, and you: our community. Fortunately for all of us, good healthy plants TASTE BETTER, TOO! A last word on "organic"
I started off by writing that we don't feel we need the USDA's rubber stamp since we have this direct connection to all of you. That's true. At the same time, there are some farms that seem similar to ours, but maybe sometimes use some seeds treated with pre-emergent fungicides, or don't bother buying more expensive organic seed when it's available, or have a bag of this or that in the shed "for emergencies", or don't use antibiotics but do use GMO animal feed. And at farmers' markets, I've overheard vendors I know d*mn well are using synthetic fertilizers, nasty systemic fungicides, and all sorts of chemical pesticides tell customers, "We're basically organic" or "We're as organic as you can get without a piece of paper." Some of this is probably just uninformed hired help instead of farmers at the stand, and some of it is just plain lying for profit. There's no way to regulate or define this grey area of "uncertified organic"... whatever its many faults, USDA certification does clear up this mud, or at least make it a crime to stretch the truth on the matter. It's a constant struggle for us to define ourselves as a farm, to explain how we're a healthy, nurturing, sustainable operation that follows the rules, when almost every market has people lying through their teeth with the same words. Every business has its bad apples, and farmers markets are no exception. It's why even farms like ours, with such a strong community connection, sometimes feel the need to get certified. There's a lot of very good uncertified farms, but there's some also some unsavory bedfellows in that grey area. So whatever complaints we make, let's also remember the other side of the coin. USDA "organic" exists for a reason. ... but we think it's important to emphasize that, to us, our relationship to you is one that's built on trust, not on some third party logo. We believe that you trust us to be good, responsible farmers, and to be straight with you. This farm is sometimes a struggle, but we're proud of the fact that at every turn, we're doing what we believe is best for our community, our soils, and the various flora and fauna that make up both. We wouldn't consider doing otherwise. Thanks for being engaged and interested, and demanding to be informed with your food dollar, and for supporting a couple of young farmers who are doing right by the land and by you.